Xcode 4 is the latest iteration of Apple’s integrated development environment (IDE), a complete tool set for building Mac OS X and iOS applications. The Xcode IDE includes a powerful source editor, a sophisticated graphical UI editor , and many other features fromhighly customization builds to support for source code repository management. Xcode can help you identify mistakes in both syntax and logic, and will even suggest fixes. Xcode 4 features a single window, called the work space window, that holds most of the data you need. 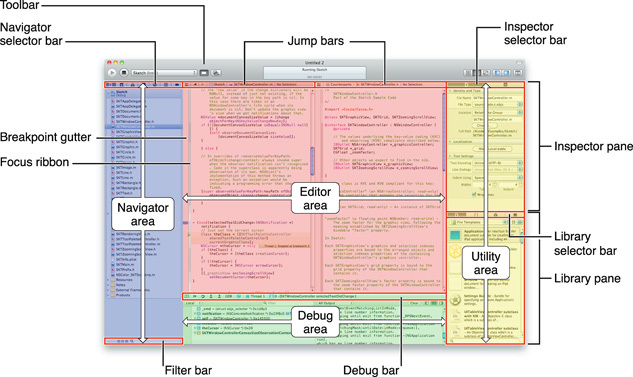 Xcode 4 has many features to make your job easier. Xcode 4 has a single-window interface for all major workflows (you can have multiple workspace windows and multiple tabs per window). The assistant editor is a split editor pane that can automatically find and open files related to the one you’re working on. For example, if you’re working on an implementation file, Assistant can automatically find and open the corresponding header file. The Fix-it feature checks your symbol names and code syntax as you type, highlights any errors it detects, and can even fix them for you. The version editor works with Git or Subversion to show a file’s entire SCM history and compare any two versions of a file. The LLVM 2.0 compiler includes full support for C, Objective-C, and C++. The LLDB debugger is fast and memory efficient. Xcode lets you work on several interdependent projects in the same workspace window, automatically determining dependencies so that it builds the projects in the right order.